After the successful completion of the Personal Entrepreneurial Development course, I had a deeper knowledge of my personal capabilities and entrepreneurial motivations to be successful. Good news, right? Not so much. I didn’t have the technical knowledge to create a sound business plan! What I did is I took an online business planning course also from University of the Philippines Open University. I immediately applied for the UP Open University New Enterprise Planning (NEP) course after the successful completion of the Personal Entrepreneurial Development course. I took NEP to further arm myself technical business knowledge to propel me into an entrepreneurship career. Though I learned some basic concepts in accounting and marketing as elective courses on my B.S. Economics course, I felt it wasn’t enough to create an actionable business plan. UPOU New Enterprise Planning (NEP) taught me how to create a real and actionable business plan. I learned the basic technical functions in business namely Operations, Marketing and Finance. First, the course taught me how to validate a business idea sourced through the business environment. I became aware of market research. The course taught me the valuable lesson on business intelligence. Then, we were tasked to map out the operations up to last detail. From, testing production methods and making a time-and-motion study on it. I can even remember drawing some layout for the store to be rented out. Then the dreaded financial statements. I can’t imagine I did a 3-year financial statement projections. It was such a struggle balancing the income statement, balance sheet and cashflow statements. What I enjoy in creating a working capital plan to grow the business. My analogy for the working capital is like a snowball drifting down a snow-covered mountain. As the snowball rolls, it gets bigger and bigger. Same as working capital, as you correctly manage and reinvest it to the business, it will grow magnifying the initial outlay. New Enterprise Planning is a struggle. Learning business planning in 5 months is not for everyone. What I truly took from New Enterprise Planning is perseverance to finish the course. The bonus part: I really took interest from learning business administration. I think NEP became the stepping stone for me in pursuing graduate studies in UP Diliman (MBA). New Enterprise Planning is a struggle. Learning business planning in 5 months is not for a everyone. Who would have taught that I would finish the course with the highest distinction the course can give? I never imagined that I could earn a High Distinction. It felt good that all my hard work paid off. However, the integration and closing program would provide a very interesting twist. About a week before the graduation, I was tasked by our instructor to give a brief speech on behalf of the UPOU New Enterprise Planning (NEP) batch since I finished the course with a high distinction.When I received the notification, I felt nervous because this is the first time I will do such an act. I was just a happy go lucky guy. A typical guy with a normal life just like you. Not in my wildest dreams that I could receive such an honor. I eventually agreed and I crammingly prepared a brief but a serious speech about my experiences a day before the program. 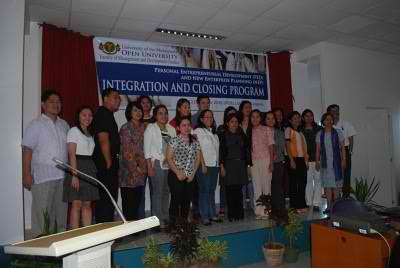 The Integration and Closing Program day came. I was very nervous that I felt like I could puke. When I was about to speak, the speech I made popped like a bubble. I was so nervous that I did not remember my prepared speech. I forgot what I would say and I just spoke spontaneously. Though the speech never went as planned, the spontaneous speech was just as great as I have hoped for. One thing I regret on that day as I didn’t ask anyone to take a photo of me speaking in front of everybody. The thing I remember in my speech, on the other hand, is about self-discipline to enhance personal development to lay the foundation for my future empire. I planned to build an empire. I was full of hope that I quit my full-time work to execute my business plan. I used all my saving to make something great. What happened next might surprise you. I failed my first business, a food business that is. I took the fall hard as I went from having a lot of savings to no money at all. I had to ask for allowances from my mom until I work in the banking industry. What the failure never took from me is the perseverance and the optimism that I learned from NEP. It made me learn more about business by pursuing MBA studies. Now, I am laughing from the petty mistakes I once did. Why Take UP Open University New Enterprise Planning? UPOU Online Business Planning Course or formally titled as New Enterprise Planning provide individuals with knowledge and skills used in preparing and analyzing sound business plans for entrepreneurial ventures. The course also instills self-discipline as modules aren’t supervised. Honesty is inculcated as no one will check how you answer the questions. you will do this on your own. Last but definitely not the least, you’ll learn perseverance. Learning business planning in 5 months is not easy and this is not for everyone. As I experienced, NEP is not for the fainted heart. If you feel you can do it then take the course. The NEP course runs from January to June and July to December of each year. You only need 5,500 pesos to enroll that includes the tuition fee, paper back issue of the NEP modules and an access to the online classroom MyPortal. Upon admission, you’ll be given a thick book about guided modules needed for the entire course. The book contains an interesting self-assessment test to find out what entrepreneurial competencies you excel at and qualities that needs development. Sign the form (CLICK HERE) for more information about the online business planning course and other distance learning courses in University of the Philippines Open University. Inquiries are also very much welcome in UPOU. Their phone numbers are: 49 536 6001 to 06 loc 710 while their email address is info@upou.edu.ph. You may look for Sir. Larry. The Author RM Nisperos is a Professor in University of the Philippines Open University. He teaches Introduction to E-Commerce Course (Certificate Program) and Public Fiscal Administration for Master of Public Management. Tremendous! This particular post is all I need to start my business. I didn’t know there is a course in UP. Thanks for the kind words on the PED program. Jabez is indeed a great educator and motivator. Good luck on NEP! I hope you’ll take Introduction to E-Commerce, I’m currently teaching it.